Keeping small animals is a lot of fun, and for many of us our small animals are as much a part of our family as our cats and dogs. We want only the best for our mutts and moggies, so why not have the best for our small pets too? A hutch is an investment, not least because it’s a large piece of kit and it needs to last many years in the unpredictable British weather. Large purchases should be expected to go the distance, and our favourite hutches come with a 3 Year Workmanship Guarantee. Your fridge-freezer comes with a guarantee, and now so does your hutch! What Makes A Good Hutch? 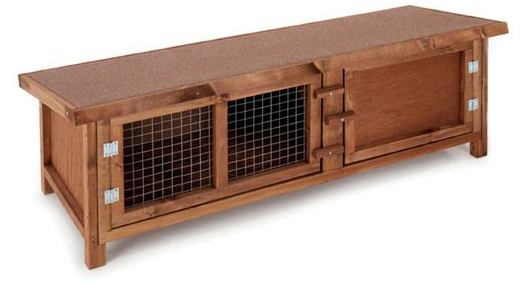 So, what should we be looking for in a good hutch? The weather in this country can be pretty miserable, and for a hutch to stand up to the deep-freeze-to-baking-hot weather, it needs to be properly made, hard wearing and long lasting. The hutches we have from Great & Small are made from Scandinavian pine, which is a stable decay resistant wood, and for those of us who are really into sustainable sources, it’s the most sustainable softwood in Europe. For extra security these hutches have a fixed floor attached to the frame, rather than a floor that simply slots in. This helps to keep furry intruders out and your furry friends in. The wire is small gauge, which means the holes are nice and small to make it awkward for furry intruders to get in – this is very important in this country as we’ve got a lot of furry things living wild in our gardens (especially those of us who live in the countryside). The feet are adjustable for a non-wobbly secure purchase on uneven ground. Visit our YouTube Channel to see our Pets Corner Strong Man bashing the heck out of the Great & Small hutches to demonstrate just how tough they are! We always recommend buying the biggest hutch possible, not because we want to make you spend more money, but because we don’t believe in housing small animals in small confined spaces. The smaller hutches in the range come with the recommendation that run space is permanently attached – Harry Potter lived under the stairs… would you want to? We’re impressed with Great & Small hutches because: – They’re made from hardy Scandinavian pine – The wood comes from sustainable sources – good for the environment – The floor is fixed and attached to the frame for security – The wire has small holes for security – The roof is hinged and opens for easy access – The feet are adjustable for a secure footing on uneven ground – They come with a 3 Year Workmanship Guarantee!